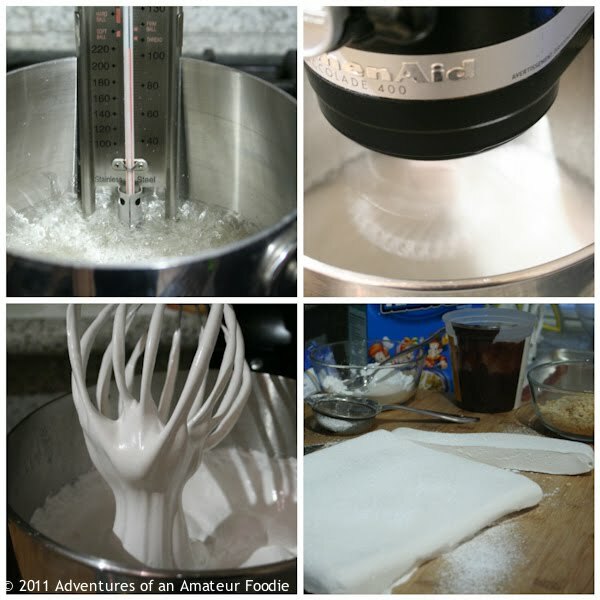 Marshmallows are one of those things that seem complicated, but are surprisingly easy to make, given the proper tools. Yet, it took years for me to try making them. I first saw them on Barefoot Contessa and I remember my boss marveling at a parent who brought homemade marshmallows to his kid's classroom. "Who the heck makes their own marshmallows?" he asked. Well... Jun does. Amanda does. Deb does. And of course, Ina does. Long after I saw that BC episode and after seeing these amazing blog posts, I had to give them a try. The caveat to marshmallow-making is the equipment. A stand mixer is needed. The other requirement is a candy thermometer, which is easily obtained from most grocery stores. Once the sugars are heated, they are added to bloomed gelatin and whipped at a very high speed until full and fluffy. Once I was done and the marshmallows set overnight, I unmolded them and cut them into cubes while using lots of powdered sugar to dust. Then I wondered what I'd do with them. I don't like eating plain marshmallows, so I had the idea of making "reverse" Rice Krispies treats. Marshmallows dipped in chocolate sauce and then dunked into puffed rice cereal. They look great and taste great, but the catch here is that the rice cereal becomes soggy really quickly. If you try this, I suggest dunking right before serving. I used the chocolate sauce recipe from Thomas Keller's Bouchon cookbook, which is insanely addictive when made with Ghiradelli's 70% cacao baking chocolate bars. The dark bitterness of the chocolate is contrasted by the super-sweet corn syrup. And of course, why make marshmallows if s'mores aren't involved? I didn't make my own graham crackers and D. and I used a Milka bar from his Christmas stocking instead of the classic Hershey's. I also didn't have a campfire nor a charcoal grill. That left my stove, the gas grill, or my Bernz-O-Matic propane torch. The propane torch won. I will never go back to the store-bought stuff. S'mores with homemade marshmallows are incredible. Caramelized crust with a pillowy middle that's still sticky like the store-bought version, but fluffy at the same time. 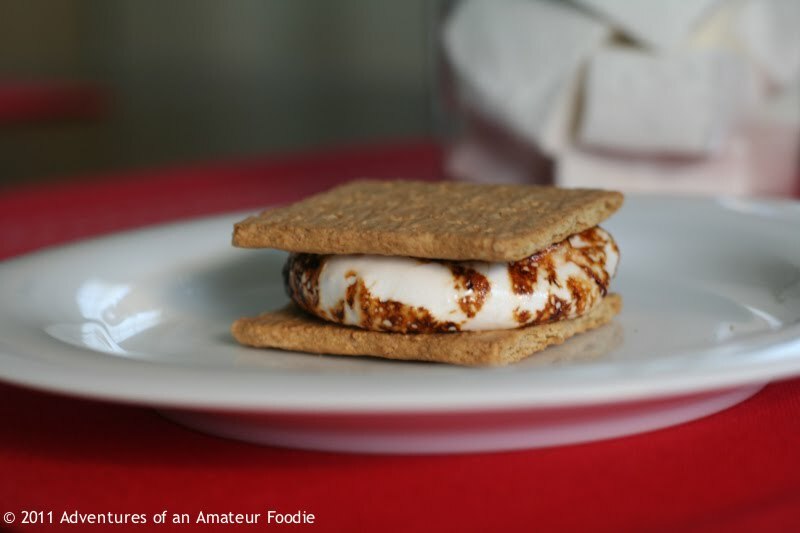 The smooth airy texture of a toasted homemade marshmallow is something that can't be achieved with the store-bought version. Butter a 13 x 9 baking pan and "flour" generously with sifted confectioners' sugar. Combine the gelatin and 1/2 cup of cold water in the bowl of an electric mixer fitted with the whisk attachment. Allow to sit at room temperature while making the syrup. Fit a small saucepan with a candy thermometer and combine the sugar, corn syrup, salt, and 1/2 cup water in it. Cook over medium heat without stirring until the sugar dissolves. Raise the heat to high and cook until the syrup reaches 240 degrees F on a candy thermometer. Remove from the heat. With the mixer on low speed, slowly pour the sugar syrup into the dissolved gelatin. Be careful of the large amount of steam that results. Put the mixer on high speed and whip until the mixture is very thick, about 15 minutes. Add the vanilla and mix thoroughly. Pour the mixture (take care, it's very sticky) into the prepared pan. Wet your hands with water lightly, smooth the top, and pat gently to ensure even distribution. Sift confectioners' sugar over the top and cover the pan. Allow the marshmallows to set overnight at room temperature. Break up the chocolate into small pieces and place in a metal bowl. Combine the cream and corn syrup in a small saucepan and heat to a simmer. Pour over the chocolate and allow to sit until the chocolate melts. It will look seized and broken. Whisk until the mixture is smooth and glossy. Store in the refrigerator. Before serving, warm gently in microwave. Serving suggestion: dip marshmallows in chocolate sauce, then dip in rice cereal or any other topping of choice. I SO want to make that! I've had marshmallows on the brain! beautiful! i'd have so much fun cutting those marshmallows...i bet it's so satisfying. I wish I was there so I could try each of those little treats. I can't decide which one I like more, the reverse rice krispies or the s'mores. So delicious. I'm going to be holding a new linky party on my blog starting this Saturday called "Sweets for a Saturday." If you get a chance, I'd like to invite you to come by then and link these up, or any other sweets you make this week. Reverse rice krispy treats? BRILLIANT!!! 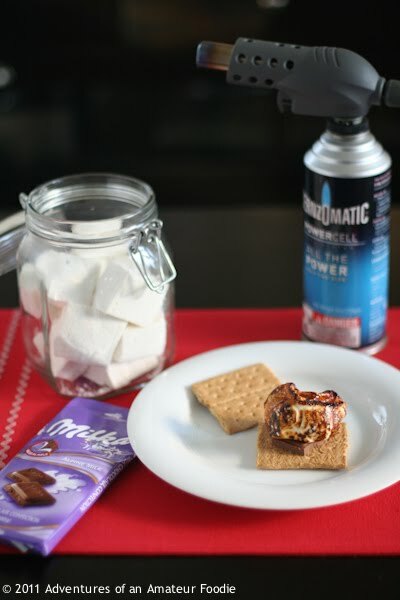 Making your own marshmallows at home is just simply amazing. It's messy but once you get over that part, it's really impressive. 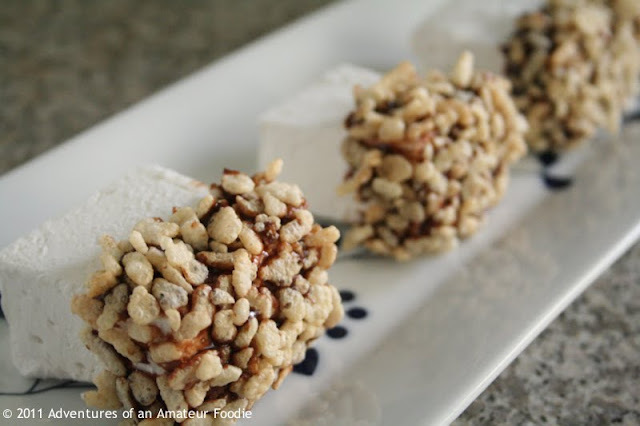 If I had a bigger sweet tooth (I'm happy with some chocolate or a slice of cheesecake from Westside) I'd make these--and I adore your reverse Rice Krispies Treats! I´ll never ever buy marshmallows again! This stuff is the best!